Former Prime Minister Manmohan Singh says India and Pakistan need to first fight the 'chronic disease of poverty in their nation'. New Delhi: Former Prime Minister Manmohan Singh Wednesday weighed in on the escalating tensions between India and Pakistan, saying a sense of “mutual self-destruction” plagued both countries. Referring to the developments that resulted in an Indian Air Force (IAF) pilot being captured by the Pakistan military, Singh added that he hoped the “events will soon find a corrective”. A Pakistan F-16 aircraft had entered Indian airspace on Wednesday morning, with the IAF successfully foiling the attack but losing a MiG 21 Bison aircraft. Later in the day, India summoned Pakistan’s deputy high commissioner and demanded the safe return of the aircraft’s pilot, Wing Commander Abhinandan Varthaman. “I hope saner counsel will prevail, and we will get back to focusing on economic development, and working on basic requirements between the two countries,” he said, adding that India and Pakistan needed to first fight the “chronic disease of poverty in their nation”. 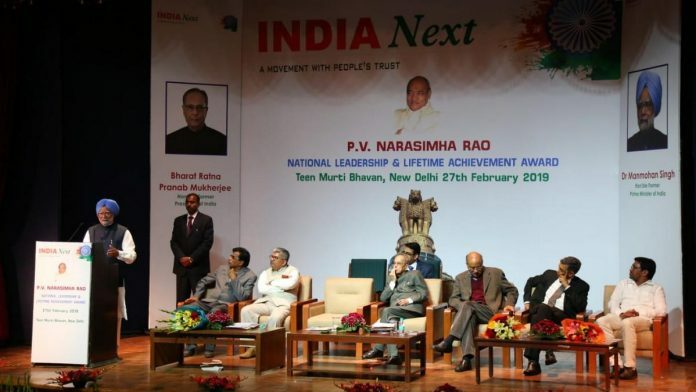 The veteran politician was speaking at the India Next P. V. Narasimha Rao National Leadership and Lifetime Achievement Award ceremony, where he was honoured for his contribution to the nation. The award was presented to Singh by former President Pranab Mukherjee in the presence of ThePrint Editor-in-Chief Shekhar Gupta and former civil servant Jayaprakash Narayan. Speaking at the event, Singh also praised the late Prime Minister P.V. Narasimha Rao for his “visionary economic policy”. India’s landmark economic liberalisation policy was launched during Rao’s tenure as PM in 1991, when Singh was the finance minister. “Governments have come and gone, but the broad contours of economic policy of India have remained the same, and credit is due to Narasimha Rao,” he said. “It is because of the continuity he (Rao) introduced that our economy has grown. We haven’t looked back since,” he added. 1. Our former PM could have reflected on performance of his government on subject of Indo-Pak relations and what prevented India from having cordial relations with Pakistan. Similarly, Pakistan’s PM should do some self-examination to find out why the entire democratic world regards Pakistan solely responsible for its strained relation with India. The whole world will hold Pakistan responsible for not acting against terror outfits like JeM, LeT, JuD and others, who are allowed to operate freely from Pakistan as they claim to destabilize India. 2. I believe that if Pakistan was surprised by the surgical bombing of specific targets in Pakistan occupied part of Kashmir, it also got a message that India would not helplessly watch Pakistan supporting JeM and others in name of Kashmir’s fight for so-called azadi. 3. I also think that bombing conveyed a message not only to Pakistan but also its friends like China and also to the separatists and politicians of Jammu & Kashmir who foolishly think and suggest that our government should have a dialogue with Pakistan. 4. Now, I believe, it is for people of Kashmir to do some critical self-introspection and take a firm stand against terrorists. Our Army protects ordinary citizens Jammu & Kashmir (J & K) from attacks of the terrorists. Question is this: Who will protect J & K citizens if the terror outfits get a free hand to suppress the citizens in whose name they are now indulging in violence? 5. I hope J & K politicians like Ms Mehbooba Mufti and Omar Abdullah and even Farooq Abdullah are aware of risks of their support to separatists and others who indulge incite violence in name of azadi. Donald Trump seems to have broken the tradition. However, one of the most exclusive clubs in the world consists of former US Presidents. Once in a while, the incumbent would speak to his predecessor(s), seeking advice, guidance, counsel, since they would be familiar with the issues and pressures. For ten years, Dr Singh carried a great weight on his shoulders. Adverting to the current situation, why he chose not to respond militarily to 26 / 11, the whole tapestry of his relationship with Pakistan, how he feels the present crisis could be resolved, his advice would be valuable. On issues of such import, political differences are not relevant. Singh is receiving award from his one time subordinate, and who had snubbed him many times. This is congress way of awarding. What a shame. Morarji Desai had started liberalization and capitalist system way before MMS finance minister, but Mrs. Gandhi’s socialist policy and nationalization of banks messed everything. No country can develop without businesses competing which was not allowed by most congress years. License Raj was way of Congress and corruption. Good joke about Morarji Desai and liberalisation. Perhaps you should write a book about it and educate the country. While focus on the economic development is laudable but we can’t keep our eyes turned off and make our people as canon fodder to the enemy nation.